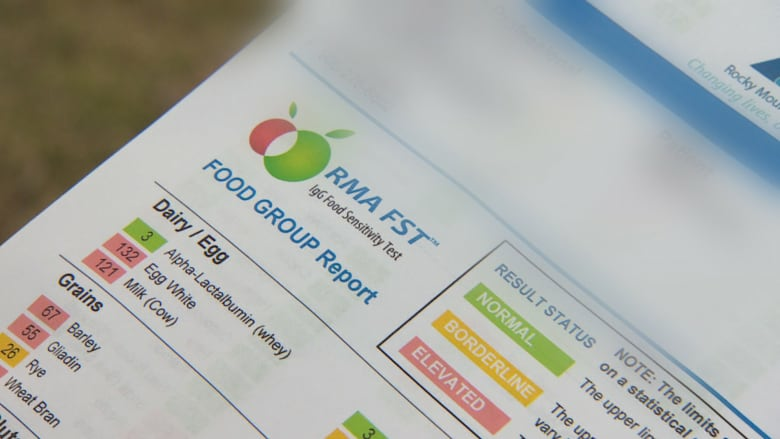 Two of Canada's biggest labs promote and offer something known as IgG food tests at their labs, marketed as a way to test for food sensitivities. But medical experts call these blood tests "irrelevant," "unvalidated" and "inappropriate" when it comes to tracking food intolerance. Feeling fat, itchy or bloated? Got tummy trouble? Want to help your hair or fix your skin? Could what you're eating be ailing you? That's certainly the sales pitch from companies behind food sensitivity tests. They're often advertised as a quick solution to a range of health issues, including by two of Canada's biggest labs — despite the fact the science behind these questionable tests has been discredited by medical groups around the world. And consumers, including Laura Chapnick, are buying in. 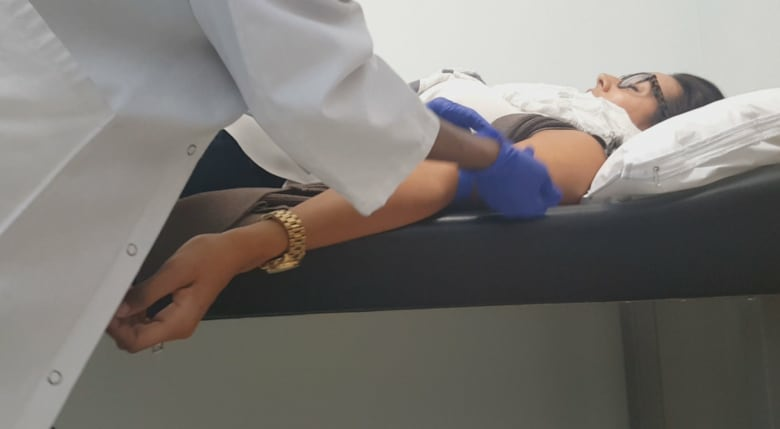 While waiting for other blood tests and an ultrasound in a Dynacare clinic, Chapnick saw an ad stating that 45 per cent of people suffer from food intolerances. Desperate for answers to her ongoing stomach problems, Chapnick later asked to take the $325 food intolerance test. She said she "genuinely believed that doing ... the blood test was going to give me absolute factual answers that I needed." Within weeks, she received a report outlining 26 foods she should reduce or eliminate altogether. Many were foods she had been eating regularly, including corn, potatoes, peanuts, wheat, milk and eggs. "These tests scared the crap out of me," she said. "These food tests scared me into believing that whatever I put in my mouth was toxic." Grocery shopping and eating quickly became a challenge. "I felt like a prisoner in my own head almost," Chapnick said, "and became very obsessive, trying to figure out what can I eat." Also on Marketplace this week: Investigating the rise of 'tech abuse' and the truth about popular (and pricey) 'teatoxes.' Watch at 8 p.m. Friday on CBC TV or online. Chapnick is not alone. The value of the global food allergy and sensitivity industry is expected to hit a whopping $24.8 billion US by 2020. And with food sensitivity tests specifically ranging in cost from more than $100 to nearly $400, companies are cashing in on the craze. Two of Canada's biggest labs, Dynacare and LifeLabs, promote and offer something known as IgG food tests at their labs, marketed as a way to test for food sensitivities. 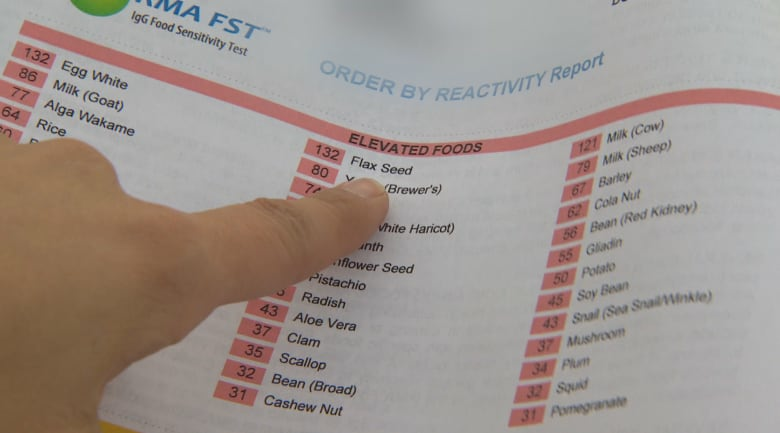 But medical experts, including the Canadian Society of Allergy and Clinical Immunology (CSACI), call IgG tests for food sensitivities "unvalidated," and more than two dozen organizations warn about the misuse of such tests. The reports being generated by the IgG test taken by Chapnick and countless others are being grossly misinterpreted, critics say. Food sensitivities are different from food allergies. An allergy is an immediate, immune response, and foods like nuts and seafood are often known to cause allergic responses that can be life-threatening. Sensitivities or intolerances, on the other hand, are not related to the immune system and often take hours, if not days, to take effect — and are therefore very difficult to diagnose. Dr. Douglas Mack, a pediatric allergy, asthma and immunology specialist, argues the results of an IgG test are an indication that you had exposure to the foods — not an intolerance of them. IgG tests measure levels of an antibody known as Immunoglobulin G — or IgG, for short. "It should be used to track whether a patient actually is developing tolerance, not intolerance," he said. Interpreting the test otherwise is not only incorrect, but potentially hazardous to your health, Mack argues. By unnecessarily eliminating foods, he says he sees "kids that are coming in with nutritional deficiencies, with failure to grow very well." Removing foods from your diet could also lead to development of a food allergy, especially in children, says Mack. One young patient of his developed a milk allergy after eliminating it from his diet when a food sensitivity test suggested he had a milk intolerance. "If these tests result in the harm of a child, we really gotta think twice about whether or not these labs should be offering these," he said. To test the accuracy of these food sensitivity tests, Marketplace ran several different kinds on host Charlsie Agro, including drawing blood for the IgG tests offered by Dynacare and Rocky Mountain Analytical, which is owned by LifeLabs. Both tests require a requisition from a naturopathic doctor or licensed physician. LifeLabs' test is typically offered through naturopaths or other health outlets, however, while Dynacare's food intolerance test is advertised and promoted directly to the consumer in its clinics. The results from the Rocky Mountain Analytical test reported intolerances to 52 foods, while Dynacare reported 30 intolerances. Before taking the tests, Agro had tracked what she was eating. Yet both tests reported intolerances to foods she regularly consumed, with absolutely no adverse reactions. For example, Agro had a smoothie, which included flax seeds, for breakfast daily. Yet both tests suggested Agro is intolerant to flax. She also ate vegetable soup — containing barley, kidney beans and corn — without problem. Both IgG tests again claimed Agro is intolerant to these foods. Both sets of lab results also showed Agro is "intolerant" of egg whites, all milks, wheat and gluten — all foods she eats regularly without issue. IgG is really a memory antibody, says Dr. David Stukus, an associate professor of pediatrics with the allergy and immunology department at the Ohio-based Nationwide Children's Hospital. "Measuring specific IgG levels merely detects that the person has eaten it at some point in the past," he said. "It is a normal physiological response to eating." Stukus also said it wasn't surprising that foods Agro hadn't consumed in the weeks leading up to her blood tests showed up in her results. Some foods "have cross-reactivity," he said, meaning the proteins in one food are similar to the proteins in another. "So it is possible that [the test] is picking up the memory antibody of other similar foods that have been eaten in the past," Stukus said. He points to peanuts as a common example: If you've eaten peanut butter, your results might suggest you are intolerant to other legumes, like soy or other beans. More than 25 leading health organizations from around the world have warned about the misinterpretation of IgG tests, including a Health Canada scientist who wrote "these tests are not reliable and should not be recommended as a single diagnosis tool." Position papers from international medical communities have called the IgG blood test for food sensitivities "irrelevant," "unvalidated" and "inappropriate," warning that the test provides "false diagnoses" and that "the test should not be performed" for such a purpose. There can also be adverse effects to drastically limiting your diet, including malnutrition and disordered eating patterns, says Stukus. Chapnick said her eating patterns changed significantly after she got her IgG test back, which was done by Dynacare. So she turned to registered dietitian Elke Sengmueller to develop a diet she was comfortable with based on those results. But Sengmueller says the radical changes the test was calling for would put Chapnick's already compromised health in jeopardy. "Because she had drastically cut down her foods already, because of her symptoms and her pain and not getting any answers, she was afraid to eat," she said. "If she were to continue this … for an extended period of time, given her medical history I could see it … possibly leading to death." Mack says he is especially troubled by the IgG claims being made by LifeLabs and Dynacare through its marketing, as these are two of Canada's largest blood labs, conducting millions of tests annually for everything from cancer screening to workplace drug testing. "These are labs that we send patients to to get their bloodwork done for their iron, or to see if they have cancer, or to see whatever," he said. "But in the same place, these labs are now offering a test for which there is no validity." 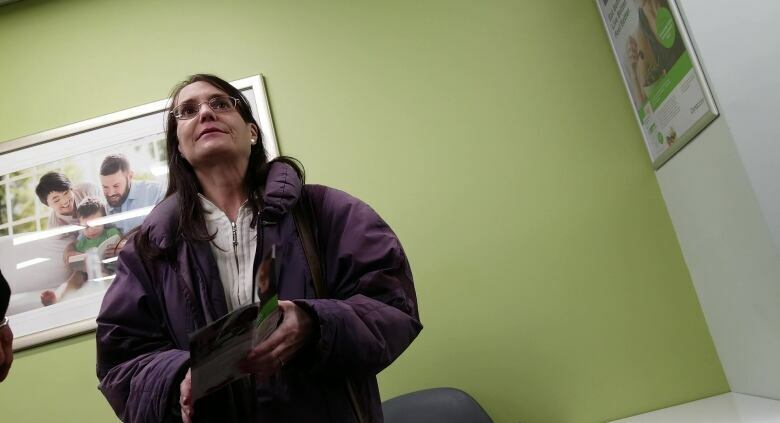 "I'm surprised that an organization as reputable as Dynacare would be offering this to their clients, especially while they're waiting to get their blood work done — they're kind of a captive audience. It's disappointing." When Marketplace asked the Ontario Ministry of Health about the manner in which IgG tests are being marketed in the province, a spokesperson said that labs are "operating as private businesses … and are allowed to provide a variety of tests that they are licensed to perform." Health Canada told Marketplace it has issued medical device licences for some IgG tests, but that none are "intended to be a single tool to be used for diagnosis of food intolerance." In its response, Dynacare said that "debate exists" about the use of the tests for food sensitivities, but "peer-reviewed articles support the use of the food IgG test as an additional source of information." And the company said it "relies on the expertise of the ordering health professional to determine the appropriateness of a particular test for a particular patient." LifeLabs, the parent company of Rocky Mountain Analytical, also said that "numerous studies in peer-reviewed journals have shown the health benefits of removing IgG-reactive foods," and that "a test does not need to be diagnostic to be clinically relevant and useful." Dynacare and LifeLabs provided those peer-reviewed studies to Marketplace, which were then analyzed by clinical epidemiologist and biostatician Jason Busse, DC, PhD. He found that "all of the studies were very problematic," and said he was "amazed that many of them were published." If you're worried about how the food you're eating might be affecting you, health professionals say the best place to start is by keeping a detailed food and symptom diary, tracking what you're eating and how it makes you feel. It's important to visit a registered dietitian or family physician before starting any kind of elimination diet, they say.